There are many pastoral occasions for giving praise to God and praying for children who have already been baptized: for example, when the parents request a blessing, when special feasts are held for children, when the school year begins. The celebration of a blessing is to be adapted to the circumstances. The present orders may be used by a priest or a deacon. They may also be used by a layperson, particularly a catechist and also a person in charge of the children's education, who follows the rites and prayers designated for a lay minister. While maintaining the structure and chief elements of the rite, the minister should adapt the celebration to the circumstances of the families and children involved. When the blessing is for just one child, the minister adapts the texts accordingly or, if this seems more opportune, uses the shorter rite provided in nos. 170-172. 140 A minister who is a priest or deacon greets the children (child) and all present in the following or other suitable words, taken mainly from sacred Scripture. The grace and peace of God our Father and his Son Jesus Christ, who showed his love for children, be with you all. All make the following or some other suitable reply. 141 A lay minister greets those present in the following words. Brothers and sisters, let us praise and thank the Lord, who took little children into his arms and blessed them. Praised be the Lord now and for ever. R. Praised be the Lord now and for ever. 142 In the following or similar words, the minister prepares the children (child) and all present for the blessing. When he came into the world, our Lord, the Son of God, became a child and grew in wisdom, age, and grace in the eyes of God and of all who knew him. Jesus welcomed children, believed in their dignity, and held them up as a model for all who are seeking the kingdom of God. But children do need the help of grown-ups if they are to develop their individual gifts, and their moral, mental, and physical powers, and so reach human and Christian maturity. Let us therefore ask for God's blessing, so that we will devote ourselves to the Christian upbringing of these children (this child) and so that they (he/she) will accept willingly the guidance they (he/she) need (needs). 10:13-16 Jesus blessed the children. People were bringing children to Jesus that he might touch them, but the disciples rebuked them. When Jesus saw this he became indignant and said to the disciples, "Let the children come to me; do not prevent them, for the kingdom of God belongs to such as these. Amen, I say to you, whoever does not accept the kingdom of God like a child will not enter it." Then he embraced the children and blessed them, placing his hands on them. 18:1-5,10 Whoever welcomes one such child for my sake welcomes me. At that time the disciples approached Jesus and said, "Who is the greatest in the kingdom of heaven?" He called a child over, placed it in their midst, and said, "Amen, I say to you, unless you turn and become like children, you will not enter the kingdom of heaven. Whoever humbles himself like this child is the greatest in the kingdom of heaven. And whoever receives one child such as this in my name receives me. "See that you do not despise one of these little ones, for I say to you that their angels in heaven always look upon the face of my heavenly Father." 145 Or: Matthew 19:13-15-Let the children come to me. Matthew 21:14-16-From the speech of infants and children you have framed a hymn of praise. Luke 2:46-52-Jesus progressed in wisdom, age, and grace. 146 As circumstances suggest, the minister may give those present a brief explanation of the biblical text, so that they may understand through faith the meaning of the celebration. The explanation should be short and suited to the children's (child's) understanding, but it should also be helpful to the adults. 147 After the reading or after the instruction, a psalm, a hymn, or some other song familiar to the children (child) may be sung. R. We are his people: the sheep of his flock. Sing joyfully to the LORD, all you lands; serve the LORD with gladness; come before him with joyful song. R.
Know that the LORD is God; he made us, his we are; his people, the flock he tends. R.
Enter his gates with thanksgiving, his courts with praise; Give thanks to him; bless his name. R.
For he is good: the LORD, whose kindness endures forever, and his faithfulness, to all generations. R.
Psalm 150:1-2, 3-4, 5 R. (5c) Let everything that breathes praise the Lord! 148 The intercessions are then said. The minister introduces them and an assisting minister or one of those present announces the intentions. From the following intentions those best suited to the occasion may be used or adapted, or other intentions that apply to the particular circumstances may be composed. Two formularies are provided here, the second of which is a model that invites a response by the children (child) or allows for their adding their own intentions. R. Lord, in children let us welcome you. R. Lord, hear our prayer. Assisting minister: Lord Jesus, born of the Virgin Mary, you sanctified childhood; grant that these children (this child) may grow as you did in wisdom, age, and grace. (For this we pray:) R.
Assisting minister: Through their (his/her) parents and the Church you show these children (this child) the tenderness of your own love; grant that those entrusted with their (his/her) care will be tireless in watching over them (him/her). (For this we pray:) R.
Assisting minister: In baptism you have given all of us rebirth to a new childhood and opened to us the doors to your Father's house; grant that as faithful servants we may follow wherever you lead. (For this we pray:) R.
Assisting minister: Even as a child you had to undergo persecution and exile; grant that all children who are victims of the evil of these times may find help and protection. 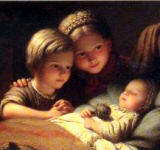 (For this we pray:) R.
Lord Jesus, you welcomed and blessed little children; listen kindly to our prayer. Assisting minister: Protect us from all dangers. R.
Assisting minister: Watch over our life and our upbringing. R.
Assisting minister: May we grow in wisdom, age, and grace in the eyes of God and of our neighbors. R.
Assisting minister: Help all of today's children. R.
Assisting minister: Let us thank you for your gifts to us. R.
Assisting minister: Bless our parents, friends, and all who are kind to us. R.
150 A minister who is a priest or deacon may, as circumstances suggest, hold his hands outstretched over the children (child), as he says the prayer of blessing. Lord, our God, out of the speech of little children you have fashioned a hymn of praise. Look with kindness on these children (this child) whom the faith of the Church commends to your tender care. Your Son, born of the Virgin Mary, gladly welcomed little children. He took them in his arms, blessed them, and held them up as an example for all. We pray that you, Father, will also send your blessing on them (him/her), so that they (he/she) may grow in Christian maturity and, by the power of the Holy Spirit, become Christ's witnesses (witness) in the world, spreading and defending the faith. 151 A lay minister says the following prayer of blessing with hands joined. Lord Jesus Christ, you loved children so much that you said: "Whoever welcomes a child welcomes me." Hear our prayers and, with your unfailing protection, watch over these children (this child) whom you have blessed with the grace of baptism. When they (he/she) have (has) grown to maturity, grant that they (he/she) will confess your name in willing faith, be fervent in charity, and persevere courageously in the hope of reaching your kingdom, where you live and reign for ever and ever. 152 After the prayer of blessing, the minister may sprinkle the children (child) with holy water and, as circumstances suggest, may say: Let this water call to mind our baptism into Christ, who has redeemed us by his death and resurrection. 153 A minister who is a priest or deacon concludes the rite by saying: May the Lord Jesus, who loved children, bless you and keep you in his love, now and for ever. 154 A lay minister concludes the rite by signing himself or herself with the sign of the cross and saying: May the Lord Jesus, who loved children, bless us and keep us in his love, now and for ever. 155 It is preferable to end the celebration with a suitable song. 156 A gathering in preparation for a baptism soon to be celebrated is an opportune occasion for the blessing of a child not yet baptized through a celebration similar to the blessings imparted during the catechumenate. Pastoral practice should include an explanation of why the parents or the minister trace the sign of the cross upon the child, namely, as an indication that the child is marked by the sign of salvation, is already dedicated to God, and is being prepared for the reception of baptism. 157 The present order may be used by a priest or deacon. It may also be used by a layperson, particularly a catechist, who follows the rites and prayers designated for a lay minister. 158 When the family has gathered, the minister says: In the name of the Father, and of the Son, and of the Holy Spirit. 159 A minister who is a priest or deacon greets the child and all present in the following or other suitable words, taken mainly from sacred Scripture. The grace and peace of God our Father and his Son Jesus Christ, who showed his love for children, be with you all. Or: Blessed be God for ever. 160 A lay minister greets the child and all present in the following words. Brothers and sisters, let us praise and thank the Lord, who took little children into his arms and blessed them. Praised be the Lord now and for ever. 161 In the following or similar words, the minister prepares those present for the blessing. When he came into the world, our Lord, the Son of God, became a child and grew in wisdom, age, and grace in the eyes of God and of all who knew him. Jesus welcomed children, believed in their dignity, and held them up as a model for all who are seeking the kingdom of God. Let us therefore ask for God's blessing, so that we will devote ourselves to the Christian upbringing of N. and so that he/ she will accept willingly the guidance he/she needs. 162 One of those present or the minister reads a text of sacred Scripture, taken preferably from the texts given in the Rite of Baptism for Children and the Lectionary for Mass (see endnote 11). A reading should be chosen that best serves the preparation of the parents for their child's baptism. 10:13-16 Jesus blessed the children. People were bringing children to Jesus that he might touch them, but the disciples rebuked them. When Jesus saw this he became indignant and said to the disciples, "Let the children come to me; do not prevent them, for the kingdom of God belongs to such as these. Amen, I say to you, whoever does not accept the kingdom of God like a child will not enter it." Then he embraced the children and blessed them, placing his hands on them. 163 As circumstances suggest, the minister may give those present a brief explanation of the biblical text, so that they may understand through faith the meaning of the celebration. 164 After the reading or after the instruction, a psalm, a hymn, or some other song familiar to the child may be sung. R. Let everything that breathes praise the Lord! Psalm 150 Alleluia. Praise the Lord in his sanctuary, praise him in the firmament of his strength. Praise him for his mighty deeds, praise him for his sovereign majesty. R.
Praise him with the blast of the trumpet, praise him with lyre and harp. Praise him with timbrel and dance, praise him with strings and pipe. R.
Praise him with sounding cymbals, praise him with clanging cymbals. Let everything that has breath praise the LORD! Alleluia. R.
165 The intercessions are then said. The minister introduces them and an assisting minister or one of those present announces the intentions. From the following intentions those best suited to the occasion may be used or adapted, or other intentions that apply to the particular circumstances may be composed. Assisting minister: Lord Jesus, you will new children to be begotten for the Church not by human birth but by God; grant that the time of awaiting baptism may be one of a more complete preparation for its celebration. (For this we pray:) R.
Assisting minister: Through his/her parents and the Church you show this child the tenderness of your own love; grant that those entrusted with his/her care will be tireless in watching over him/her. (For this we pray:) R.
166 A minister who is a priest or deacon says the prayer of blessing while laying hands on the child; a lay minister says the prayer with hands joined. All-powerful God and Father, you are the source of all blessings, the protector of infants, whose gift of children enriches and brightens a marriage. Look with favor on this child and, when he/she is reborn of water and the Holy Spirit, bring him/her into your own spiritual family, the Church, there to become a sharer in your kingdom and with us to bless your name for ever. 167 In silence the minister and the parents trace the sign of the cross on the child's forehead. 168 A minister who is a priest or deacon concludes the rite by saying: May the Lord Jesus, who loved children, bless you and keep you in his love, now and for ever. R. Amen. 169 A lay minister concludes the rite by signing himself or herself with the sign of the cross and saying: May the Lord Jesus, who loved children, bless us and keep us in his love, now and for ever. R. Amen. 170 The minister says: Our help is in the name of the Lord. All reply: Who made heaven and earth. Mark 10:14 When Jesus saw the disciples rebuking the people he became indignant and said to them, "Let the children come to me; do not prevent them, for the kingdom of God belongs to such as these." Matthew 18:3 Jesus said to his disciples: "Amen, I say to you, unless you turn and become like children, you will not enter the kingdom of heaven." Matthew 18:5 Jesus said to his disciples: "Whoever receives one child such as this in my name receives me." 1 Corinthians 14:20 Brothers, stop being childish in your thinking. In respect to evil be like infants, but in your thinking be mature. 172 A minister who is a priest or deacon says the appropriate prayer of blessing while laying hands on the child; a lay minister says the prayer with hands joined. Lord Jesus Christ, you loved children so much that you said: "Whoever welcomes a child welcomes me." Hear our prayers and, with your unfailing protection, watch over this child whom you have blessed with the grace of baptism. When he/she has grown to maturity, grant that he/she will confess your name in willing faith, be fervent in charity, and persevere courageously in the hope of reaching your kingdom, where you live and reign for ever and ever. 173 As circumstances suggest, a priest or deacon may use the following short blessing formulary. May the Lord Jesus, who loved children, bless + you, N., and keep you in his love, now and for ever. Endnotes: 11. See Rite of Baptism for Children, nos. 186-215; Lectionary for Mass (2nd ed., 1981), nos. 751-763 (Ritual Masses, I. Christian Initiation, 1. Order of Catechumens and Christian Initiation of Adults, Christian Initiation Apart from the Easter Vigil and 2. Christian Initiation of Children).